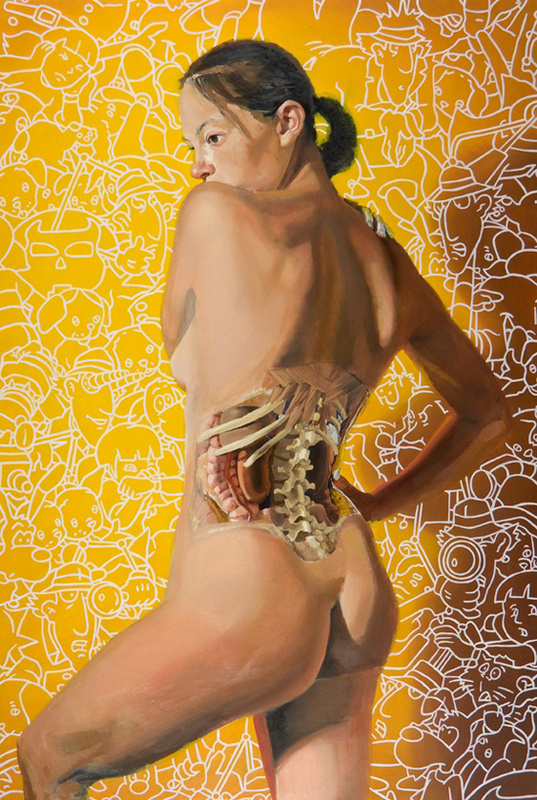 The nervous system is split into two sections. One is the central nervous system which includes the brain and spinal cord while the peripheral nervous system includes the cranial and spinal nervous and provides the communication between the CNS and the rest of the body. Two main cell types, neurons and neuroglia. The neurons are the basic structural units of the nervous system. The neuroglia provide support for the neurons. Neurons transmit electricity through their plasma membrane and lose their ability to divide once they commit to their roles (after birth). They last a life time, hopefully, and the advantage is that they store memory but if they are destroyed they cannot be replaced. 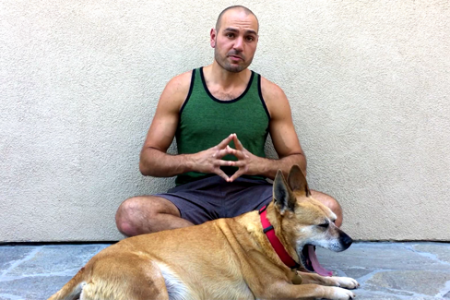 However with that said, you can retrain other parts of the brain to take over functions. Neurons also require lots of oxygen and glucose and will die within 5 minutes without oxygen. The nucleus body = soma. Dendrites increase surface area. And there’s an axon. Most of them have one axon but some have two. This is what transmits the electrical impulse. At the end of the axon we have axon terminals (or boutons; french for button) that almost touch the dendrites of the next neuron. The cone shaped thing that the axon leads into is the axon hillock where it takes all the signals from the cell and processes whether it’s big enough to send the signal down the axon toward the end. Neurofibrils holds the cell together and are made of intermediate filaments (there’s lots of these). 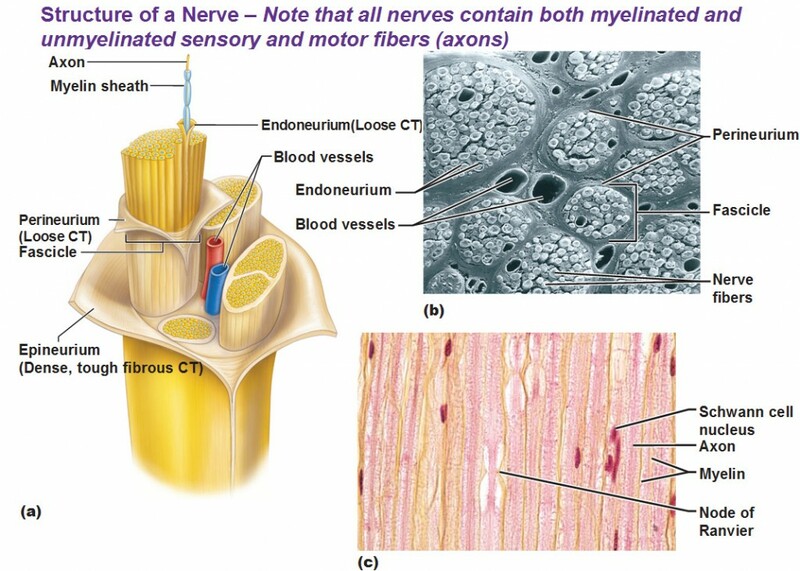 Axons are made of neurofibrils + actin microfilaments + tubulin microtubules to give extra strength. Nissl bodies are the equivalent of rough ER for neurons. 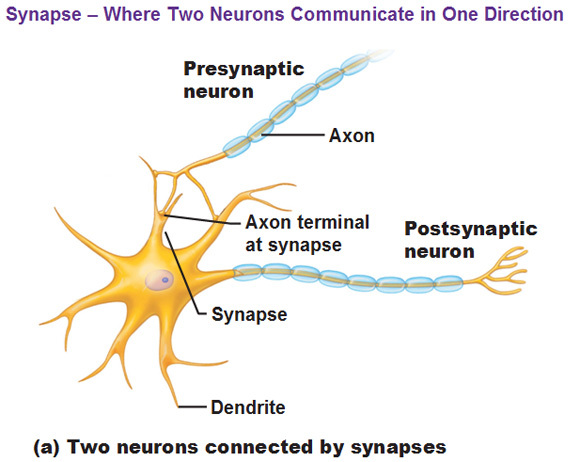 Synapse is defined as the space where 2 neurons communicate in one direction. You see below how the synapses reach out and touch the dendrites? They almost touch. The space between them is the synaptic cleft. 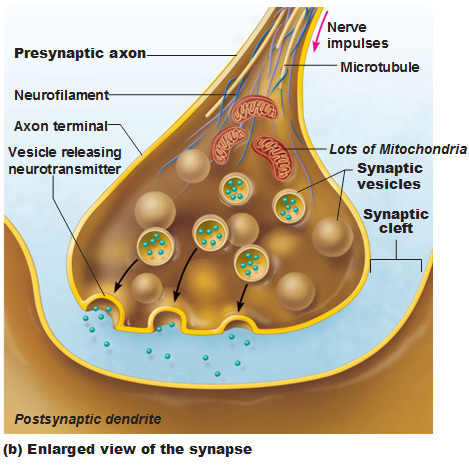 Synaptic vesicles contain neurotransmitters, released by exocytosis, which attach to receptors. Sensory neurons aka afferent neurons transmit impulses toward the CNS from receptors located in the PNS. 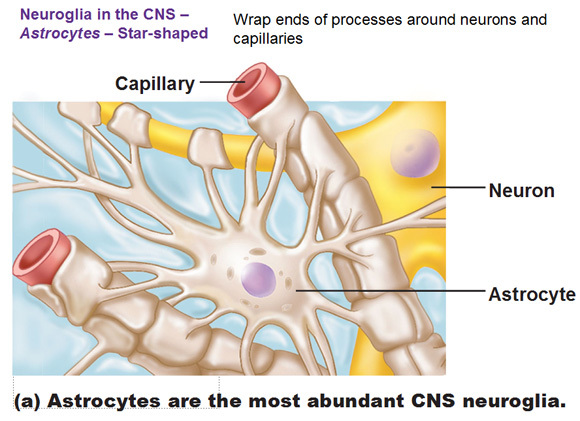 Their cell bodies are located in ganglia, which are cell body clusters located outside the CNS. 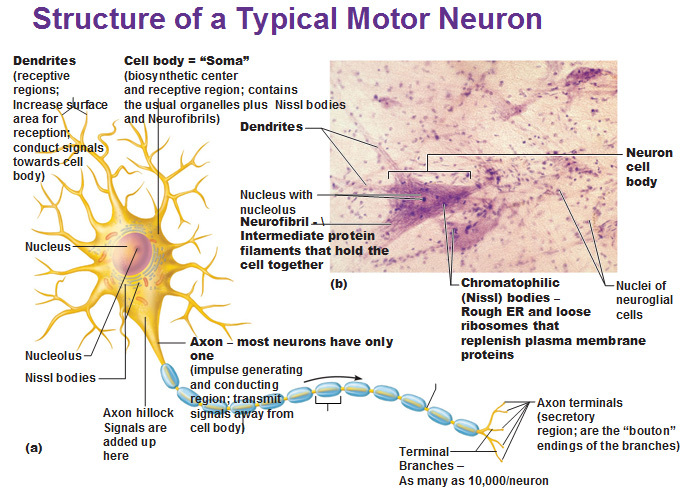 Motor neurons aka efferent neurons transmit impulses away from the CNS to muscles and glands (effectors). Most of the cell bodies are located in the CNS, which is why someone may not have a limb anymore, but feel like they still do, or even have phantom pain, which we will discuss later on. Interneurons make up most of the neurons in your body (99.98% of them). They are located in the CNS and usually link the sensory and motor neurons in a chain. Glial cells are a general category of cells found in your Central Nervous System. They make up half your brain mass. About 10 to 1 ratio of them relative to neurons and these glial cells can divide. 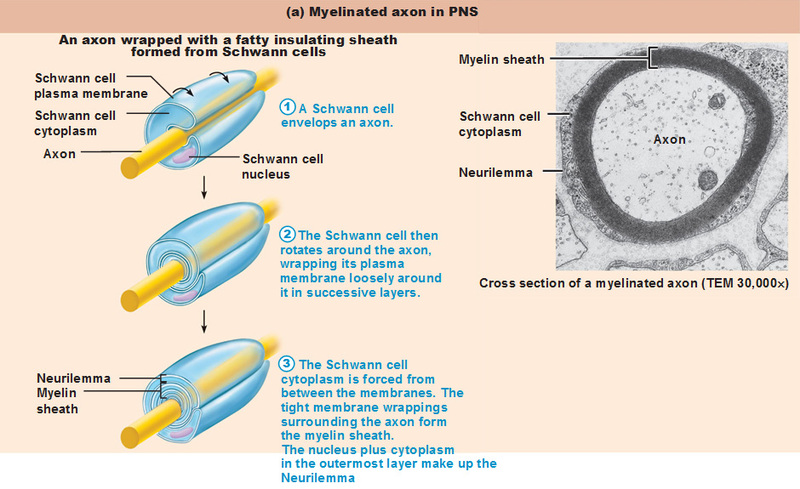 Myelin sheaths are formed by the wrapping of either Schwann cells (PNS) or Oligodendrocytes (CNS) around axons. The lipoprotein in a myelin sheath is called.. myelin! It helps insulate the axon to prevent interference from nearby neurons and increases the impulse speed. Astrocytes are extensions that wrap around a neuron and capillary to hold things into place. 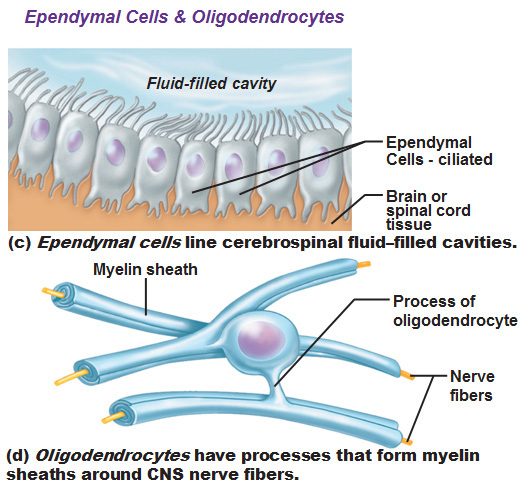 Ependymal cells line a cavity filled with cerebrospinalfluid (these cells create the fluid from blood). Oligodendrocytes wrap themselves around axons called a myelin sheath. The myelin sheath has a lot of plasma membrane but not cytoplasm. The phospholipid bilayer acts as an insulator as a myelin sheath so that the electrical impulses pass very fast through the axon. Satellite cells (not related to muscle satellite cells) surround neuron cells within ganglia. Schwann cells don’t touch each other to create Nodes of Ranvier. 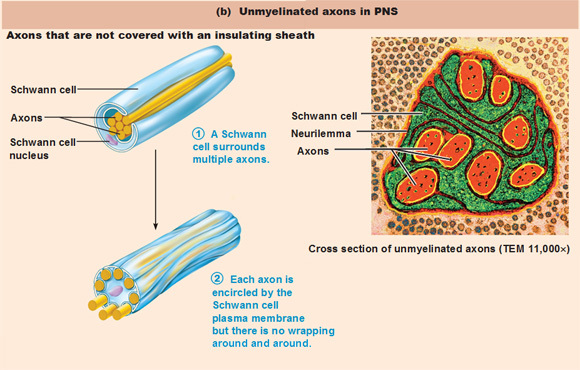 Unmyelinated axons are a bundle of axons that are wrapped very thinly. 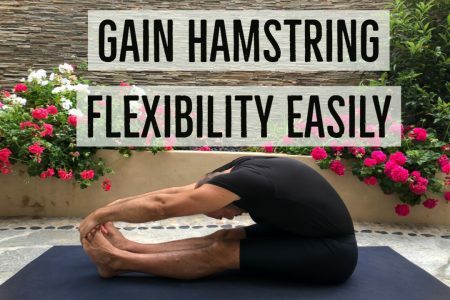 They don’t have myelin sheaths tightly wrapped multiple times. Endoneurium wraps a single axon including the myelin sheath. Fascicle is a small bundle of nerve fibers/axons. Hint: This grouping structure is analogous to the muscular organization system of epimysium, perimysium and endomysium. Gray matter = Surrounds central cavities in the CNS and contains neuron cell bodies, dendrites, and unmyelinated sheaths. White matter = Composed of axons only and the fat from the myelin makes it white.